I have been a little obsessed with Pinterest lately, spending hours looking at the pictures and pinning away. I stumbled across "Vintage Toys" and was beyond excited to see all my favorite childhood toys. As soon as I saw them all, I just knew I need to blog about them. Being a girly girl, you know my favorite toys would be all girly girl. 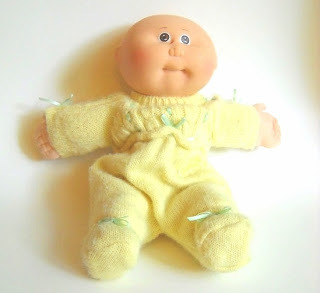 Without a doubt, my absolute favorite toy was my doll, the Cabbage Patch Kid. Kelly, that's what I named her, went everywhere with me. EVERYWHERE! And if you are wondering, yes, I still have her. I actually have all my Cabbage Patch Kids (4 in total). They are stored nicely at the top of my closet. I make sure to check on them (yearly), just to make sure nothing has happened to them. The first toy, I really remember was the Fisher Price Yellow Purse. It even had a little mirror in it. That purse also went everywhere with me. I kept my lipstick (which was chapstick), paper, crayons and some fake money. Sadly, I don't recall what happened to my purse. I think I lost it somewhere. The toy that I spend the most time playing though is the Fisher Price Doll House with the little people. Although, I lost the dad and the dog at Friendly's because I just to take the house and the family to dinner with us. 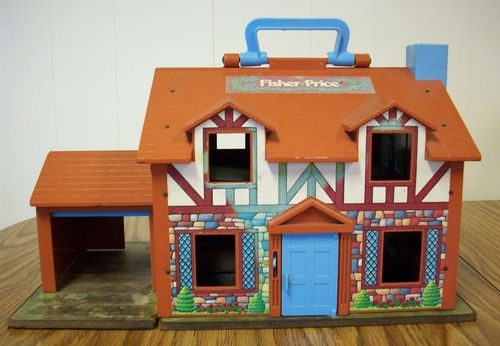 I played with this this for hours and hours and hours. I can still say that it breaks my heart that my mother threw this out. I'm still angry at her for doing so. Granted I was like 15 and hadn't played with it in years, still! She should have kept it!!! LOL! 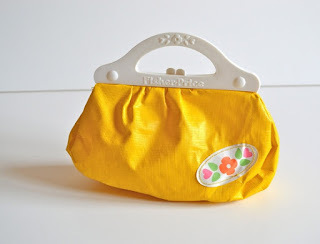 Tomorrow's post will be JenniSixx's Favorite Childhood Toys. I think you may be surprised at them!! i loved cabbage patch and my little pony stuff! OHMYGOD i had a cabbage patch doll too that i lived for!!! ditto w/ the comment above i had lots of my little pony's too hehehe :) ohhh and polly pockets! omgosh love! you know what i always wanted a eazy bake oven.. and i never got one.. sometimes i'll see it when i walk by the toy section in target.. and the new ones are WAY WAY more badass then the ones that were available when we were kids and i'm so tempted to buy one HAHAHA. I still have my cabbage patch doll ... she is in a locked box with some other childhood faves! 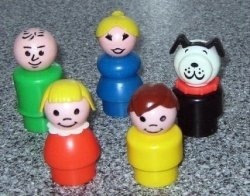 Oh how I miss those fisher price little people!! haha that is cute, I still have some of my fisher price toys left from when I was younger, it brings back memories! Ahhh I had those old school little people!